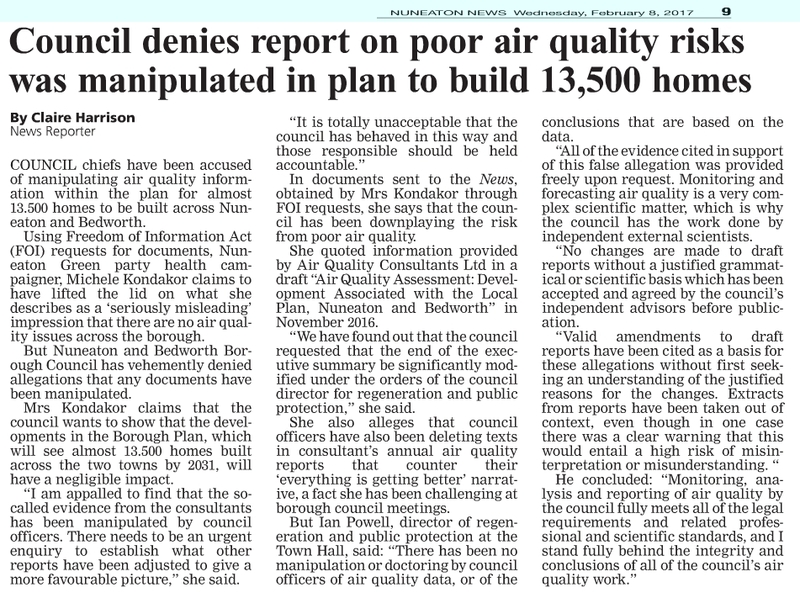 I have been supporting my wife, Michele Kondakor’s campaign to get action on Air pollution in the borough and had to attend a hearing of the Nuneaton and Bedworth standards sub-committee on Monday the 8th January 2018, accused of not treating officers with respect, bullying and bringing the council into dispute as as a result. A year ago my wife made a freedom of information request to see the correspondence between the Borough Council and consultants who produced an assessment of the air quality impact of the proposed Borough Plan. In the large amount of documents was clear evidence that borough council officers had asked the consultants to modify their report so that the summary was as positive as possible. The resultant change to the end of the report’s summary makes a massive difference. As the local green party spokesperson on health, Michele produced a press release. I uploaded the information on to this website. The press release and website gave access to all the data and the councils reasons for the changes. The Nuneaton News reported on Michele’s comments and gave the council the opportunity to reply. I had a meeting with the council’s managing director on 7th February and made him aware of the concerns over how the air quality assessment had been changed at the request of council officers. The managing director said he would ask for the internal auditor to undertake an investigation. This was expected to take 2 weeks but dragged on for around 7. 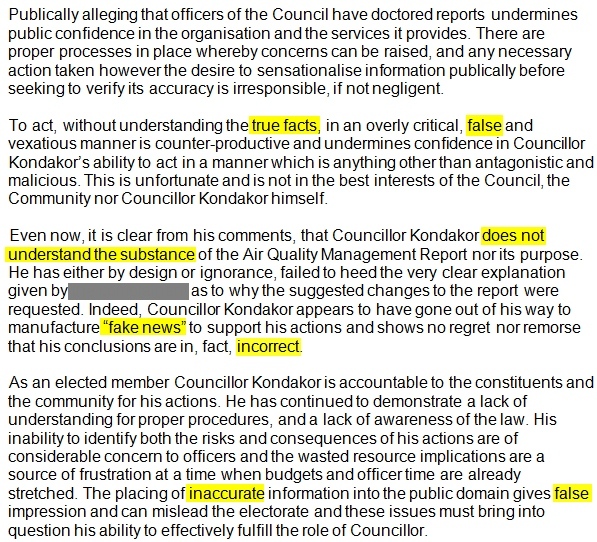 The internal auditor did not interview me and seems to be just talking with officers and the external consultants to justify the council’s actions. Eventually, on the 28th March, I got an email telling me that nothing had been manipulated. I faced a standards hearing for raising the issue and publicising that the council has asked consultants to very significantly change the last section of their conclusion. It is clear that the internal audit investigation was not interested in finding out our concerns. The officer did not communicate with me and would not talk to me about the internal audit investigation. The internal auditor only seemed to talk to those who asked for the report to be modified and the consultants who did the changes. By only taking them the investigation report issue 6 was clearly going to find the changes justified. After that I was informed that a complaint had been made about me but I was provided with very few detail. I was asked to comment but was not interviewed. Without sight of the complaint it was impossible to produce a detailed response at that point. 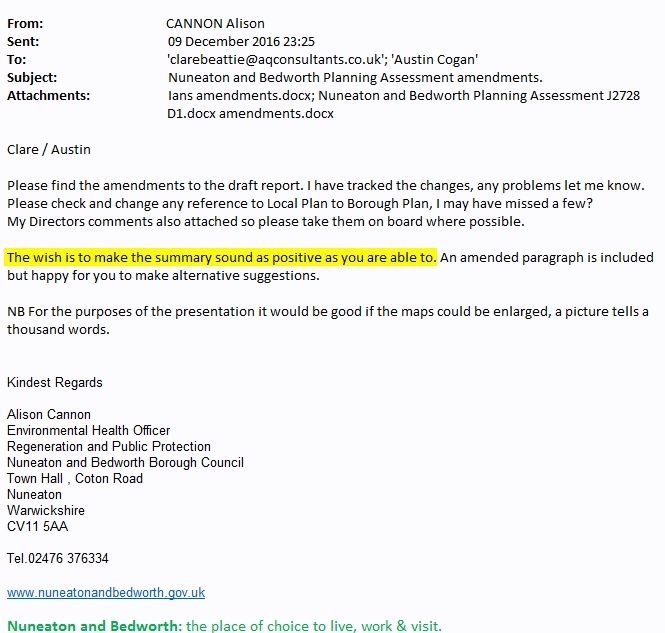 The actual allegation is that council staff asked the consultants to change the end of the summary which totally removed the bit stating the Borough plan would make the air quality worse in town centres and AQMAs. We also found they had removed a line about their being no clear trend over the last 5 years and that there was errors. All that was backed up by the emails Michele obtained with her information request. later I was sent the investigating officers initial report. She had failed to interview me and clearly had the fixed idea that I was making false claims, did not understand the subject and would not accept the councils “true facts”. Below is an extract from the original version of the officers report. I managed to get some of this changed before the hearing bit it does show their mindset. Not only did I understand the reports, I was able to find loads of errors in the data on which it was based. At my hearing I was told that this was not about air quality and it did not matter if I was correct. Video from start of meeting up to when they excluded the public.